Author: Till Förster. Series edited by: Beatrix Heintze, Karl-Heinz Kohl. Since its ‘discovery’ nine centuries ago, African Art has been celebrated in countless exhibitions and colourful publications. Today, nobody is impressed anymore by the fact that African Art exists. But how do the same things develop into art in the place they emerged? Under which circumstances something we name art and what we learned to realize as art develops in an African society? These are the questions the author of this work investigates. Firstly, he describes the everyday life in the Northern part of Côte d’Ivoire – his research area – out of which all artistic forms of expression emerge. 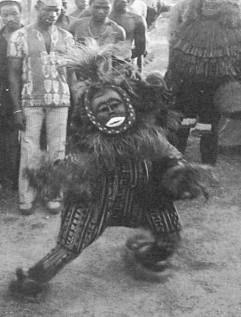 The usage of many of these forms which is often ritual is built on this everyday life, especially the mask art. Basing on detailed descriptions of the rituals, Förster outlines an alternative Ritual Theory, which does not realize the ritual experience in contrast to the everyday experience but as a modulation of the everyday life. The third part of the book draws the change of the artistic expression forms, which in former times have been embedded in the rituals. The importance of social distinctions, the political patronage during the colonial age and the independence society for a non participating audience is focussed here. This audience sees the artistic forms in a different way than participants do in rituals. These varying utilizations of artistic expression forms are often found in unmediated coexistence. They lead on the one hand to a greater plurality of single forms, on the other to clearer bounderies between the different forms of their experiences. Ingesamt bereichert das umfangreiche Buch, das zahlreiche Abbildungen, Karten, Figuren und ein Glossar enthält, unsere Kenntnis von der Senufo-Gesellschaft. What life does an [artistic] object go through before it is exhibited in the idealised room of a museum? Under which circumstances does what we call art develop in an African society? With questions like these Till Förster introduces his work. [...] All in all, the work of Till Förster opens up a new and fascinating perspective on the lives of those living on the north side of the Ivory Coast. The detailed descriptions are of great interest to academics of different areas such as Africanists, anthropologists and sociologists and hopefully lead to additional investigations within related fields.